Members of this extensive family possess a document that traces the history of the Abarbanel family and the alleged marriage of one member of the Abarbanel family to a daughter of the Gaon of Vilna. One descendant of this family is claimed to be Rabbi Moshe of Pinsk, who was married to the Gaon's daughter Khiena, hence the origin of the surname Chinitz. and the English translation is therefore a second hand source. Nevertheless it is unwise to disregard such a tradition, despite the unavailability of the original documented evidence on which the tradition was based. historical facts. Although the presence of these inconsistencies is troublesome in regard to the authenticity of the source, it is possible that they may have been deliberately construed in order to establish false identities for the Chinitz brothers, or their sons, to enable them to evade conscription into the notoriously anti-semitic Tsarist army. Whatever its other merits, the claim of the manuscript that Moshe of Pinsk changed his name to Zalmen Zelig is contrary to accepted Jewsih practice and conflicts with the facts recorded about Moshe of Pinsk. Moshe of Pinsk is accurately recorded in a number of books , including those written by the Gaon and published by Moshe, such as "Shnot Eliyahu" . Likewise Moshe's father's ancestry is detailed in "Sefer Yukhsin" 52 (Rozenkranz, 1885), and in "Zekher Leyehosef" (Stern,1898). From these sources it is clear that Moshe of Pinsk's father was Yehudah Leib of Pinsk and had no connection with the Abarbanel family. grandsons' military documents in order to confuse the authorities as to their conscription obligations. This practice was commonly used by many families which recorded some of their sons as belonging to different parents, whose sons were exempt from military service. In summary, the weight of evidence, both from those parts of the Chinitz document that are historically tenable, and from the strength of oral tradition of descent from the Gaon, held by many branches of the Chinitz family, it is the opinion of this author that such descent is most likely valid. This assertion is independent of the problems of establishing the identity of Khiena's husband as Zalmen-Zelig on the one hand and Moshe on the other. 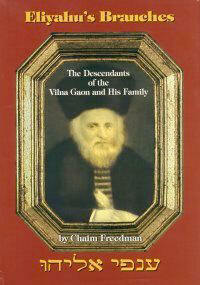 Rivlin records only one son of Khiena and Moshe of Pinsk: Avraham. To further complicate the issue, members of the Bayuk and Palefsky families claim descent from the Gaon through Moshe of Pinsk, whom they claim was known by the surname "Penchuk" or "Pinchuk". Moshe of Pinsk does not use this surname, or any other, as his signature to his introduction to "Shnot Eliyahu" . The name, probably derived from the name of the town Pinsk, may have been adopted by one son of Moshe of Pinsk, Yedidiah Penchuk, when Yedidiah left Pinsk to settle in Kobrin, and not used by Moshe himself. Archival records show that the Gaon had a daughter by his second wife Gittel nee Luntz. The daughter was named Khana after the Gaon's first wife. This may contribute to an explanation of the relationship of the Chinitz and other families from two daughters of the Gaon, Khiena and Khana. Archival records provide further information and will be presented here in the future.